Don't worry. 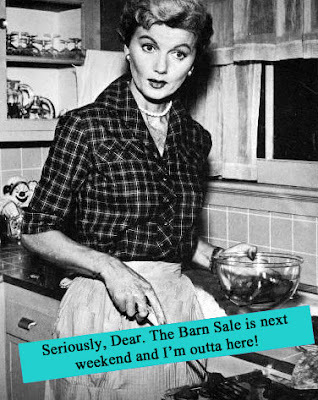 Your husband, your kids, your dogs and your dishes will survive while you grab a friend and come shop at the Barn Sale next weekend. It's a once a year event, and it's Saturday, Nov. 5th. One week from today!!!! Suzanne and I start burning the midnight oil during these last few days. Basically, my family moves into her house for a week and we set up Barn Sale headquarters. Wall to wall sleeping bags, kids that are too excited to sleep, and a frenzy of non-stop activity! We even planned a school holiday this week. All our home school lesson plans say BARN SALE! During Barn Sale week, we're totally organized, efficient, and all our ducks are in a row . 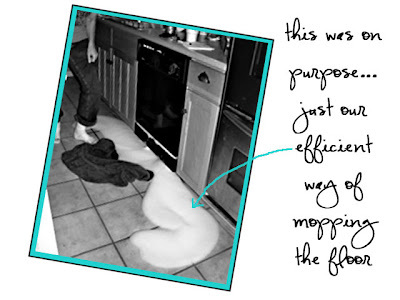 . . we take care of EVERYTHING. All three meals are pre-made, labeled, and ready for each day of the week. Each child has responsibility for a meal each day, and they make sure all dishes are cleaned, shined, and put away. The oldest does reading time with the youngest, and the middle two know the precise moment to draw the hot water and add the bubbles to our baths. Here is evidence of how on top of things we are. This picture was taken a year ago, the night before the Barn Sale. Yep. The girls at Rusted Gingham can be counted on to have spotless floors, shiny sinks, and well-rested children. Stop by any time this week and you can join us for some freshly brewed sweet tea and homemade cookies. Make sure you don't come by during 2-4, though, because that's when the kids take naps and we catch up on our novel reading, manicures, letter writing, yoga, and, of course, blog correspondence. So if you're an active blog reader, do please let us know how much you appreciate our dedication to keeping you informed! And if you ARE a regular reader, then you'll know that the only place you'll find us serving sweet tea and cookies is the Barn Sale on Saturday! hope to see you there~I added you to my blog roll!!! I happen to know that you girls make the BEST cookies. Can't wait to see y'all. Woohoo!! Can't wait!! I know your just eating bon bons this week...HA.. I am sitting here in Southern California...reading your blogs all month.....wishing I can be in Gonzales, Texas next weekend.....It's not fair...All the cool stuff goes down in Texas!!!! 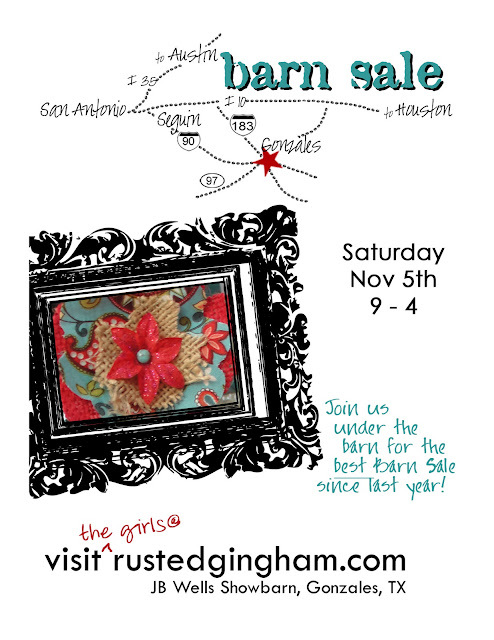 You do such a great job on your blog and Betsy & I are so excited about being a part of the barn sale. Sisters Treasures will see you on Friday and be ready for the sale on Nov. 5. "Come and get It!"